The importance of marine terraces in Quaternary Stratigraphy and the identification of eustatic oscillations is well-known. The utilization of terraces for neotectonic research is more recent and is still in the early stages of development. 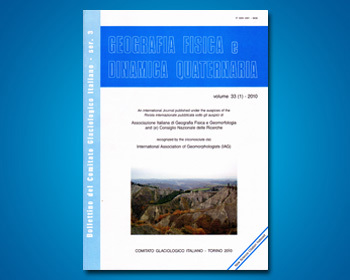 This paper synthetically presents data and ex-pounds concepts pertinent to geometry, genesis, geology, evolution and marine terrace dating, in order to single out the component, caused by Neotectonics, which has modified the correlation between the original stillstand of the sea and the present-day quota of the terrace surface. The principal events linked fundamentally to climate and Tectonics, have thus been emphasised, which could have brought about the present-day geological and morphological configuration of the terraces. By determining the chronological succession of these events, it is possible to understand firstly, the stages of the geodynamic or geomorphological evolution of the region and secondly, clarify the (not always obvious) relationship, between the age of the marine deposits and the age of the terrace surface.